NORWALK, CT – September 17, 2012 – Senior Living Business Interactive will be hosting an invaluable webcast to address the direction senior living design is headed on Thursday, September 27, 2012. Can we expect a “sea change” in senior living design in the near term? Some architects and interior designers believe that’s exactly the case. Universal design, state-of-the-art technology, “green” features—even a hospitality-style approach—are already making a pronounced impact on senior living design. Providers and developers will have to pay attention to lifestyle-driven, cost-effective design and construction in order to create communities that will attract a new generation of lifestyle-conscious seniors. Older, traditional CCRCs will at least need to retrofit their communities to bring them in line with evolving market imperatives. The moderator of the webcast, Susan Brecht, President at Brecht Associates will pose topical questions including: What does the boomer consumer want? How does design address the experiences, activities and amenities that boomers desire? Is the “traditional” or centralized design for senior communities outdated? Why does sustainable design matter? Our hand-selected panel of senior living experts will address these issues and answer any pressing questions the audience chooses to submit. Our experts include: John Bassounas, Client Services Director, Varsity Branding, Inc.; Rockland Berg, Principal and Director of Business Development, three: Living Architecture; Christine Kennedy, Executive Director, Institute for Age-Friendly Housing; and Leslie Moldow, Managing Director, Perkins Eastman. The editor of Senior Living Business Interactive, Jane E. Zarem, invites you to take part in this can’t-miss webcast. Discover where senior living design will head in the near future. Our panel of design experts will discuss visionary concepts, flexible ideas, practical implementation approaches—and, perhaps most importantly, what the next generation of residents really wants. This webcast, hosted by Senior Living Business Interactive and sponsored by The SeniorCare Investor, is expected to generate a stimulating discussion. If you’re interested in designs in skilled nursing, assisted living or independent living facilities, you won’t want to miss this fast-paced webcast, entitled “Design for Flexibility: New Looks, New Footprints,” on Thursday, September 27 at 1:00 pm ET. 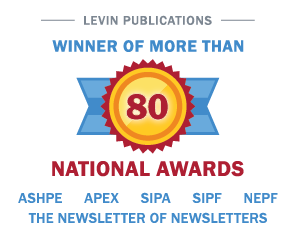 Please visit http://www.levinassociates.com/conferences/1209b-online-conference or call 1-800-248-1668 for more information about this interactive conference.